This traditional Tibetan meditation focuses on compassion, a guided meditation, usually led by resident Lama Kunga Thartse Rinpoche. 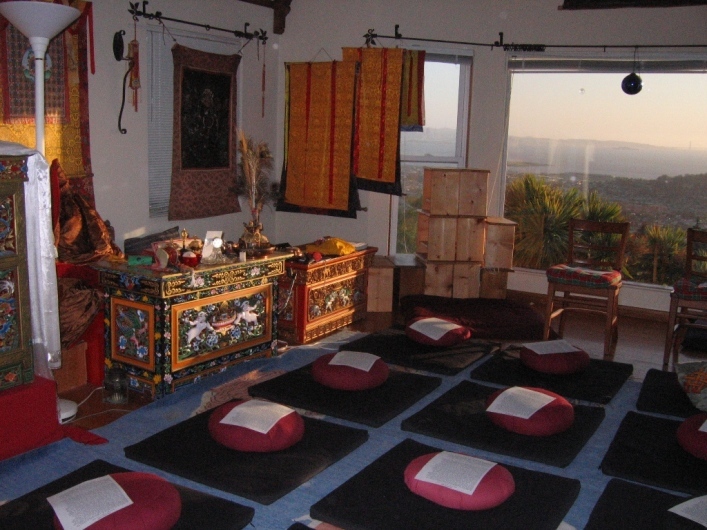 A beautiful mediation shrine room, overlooking the San Francisco Bay, with SF, Golden Gate Bridge and Mt.Tamalpais as our backdrop to this very special meditation, offered for over 40 years! The session begins promptly at 10:00 a.m. and lasts for about 90 minutes. Everyone is welcome! Each session is based on the text below, divided into four parts, alternating recitation and and reflection. CLICK HERE for ON-Screen Review. CLICK HERE for downloadable as booklet.